Place a layer of crisp lettuce in small chunks in a large wooden bowl. Spoon over the mayonnaise and spread thinly. Add a layer of sliced onions. Sprinkle onions lightly with sugar. Add a layer of cooked, chilled peas and a layer of Swiss cheese cut into julienne strips and bacon. Repeat layers until you have the quantity desired. Use no salt or pepper and do not toss. Refrigerate 1 1/2 - 2 hours, no more. Great with chopped celery, water chestnuts, green peppers also. In a large bowl (not plastic) break lettuce in bite size pieces; layer. Add frozen uncooked peas; sprinkle with celery and onion. Spread mayonnaise over top. Crumble bacon over top. Garnish with rings of green peppers. Cover and add clear plastic wrap and refrigerate for 24 hours. Do not stir. 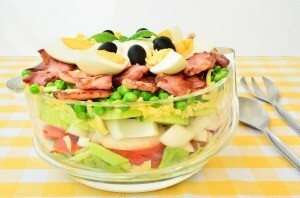 Layer as follows: lettuce, spinach, onions, peas, eggs and bacon. Mix mayonnaise with sour cream. Spread on top and seal edges. Sprinkle on dry ranch mix. Sprinkle cheddar cheese on top and let set for 8 hours before serving. Toss together before serving. Medium head of iceberg lettuce chopped or shredded. Approximately 2.5 cups chopped celery, 1/4 cup chopped yellow onion (more or less to personal taste), and 1/8-1/4 cup chopped green pepper (more or less to taste). Mix and spread on top of lettuce. 1 16 oz. package of frozen peas. Get a good name brand of your choice. Spread while frozen, do not cook. Spread approx. 3/4 of the large size jar (28oz.) of Best Foods Mayonnaise, enough to cover peas well. Top mayonnaise with approximately 3 cups shredded mild cheddar cheese. Sprinkle 2 jars of Hormel's "Real Bacon Bits" (NOT IMITATION) on cheese. Refrigerate overnight. Happy Eating! This may not sound like much, but it is so good! Source: This is my mother's recipe. Its been in our family since I can remember. She is 85 and I wouldn't know where she got it from. Her name is Janet, from Athens, Ohio. It doesn't sound like much, but this is the most yummy mix of flavors once it sits overnight. It is always the hit of any potluck, picnic, etc. I am always asked for the recipe every time I make it. I have been making this salad for over 25 years the only difference in mine is on the layer of mayo I then sprinkle sugar enough to cover mayo then I finish up with the bacon and cheese.